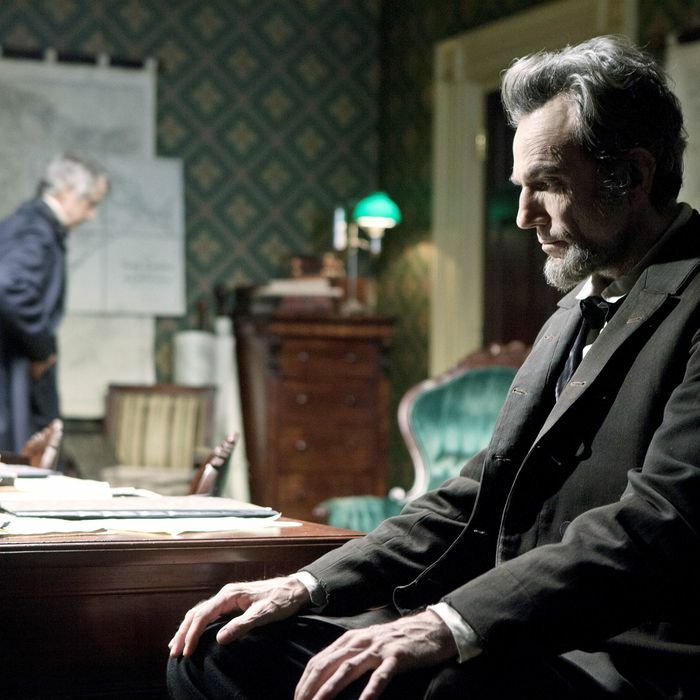 Oscars: Can Anything Beat Lincoln Now? Settled down yet from this morning’s surprising Oscar nominations? It’s time to survey the changed awards-season landscape, but there’s one thing that’s still as true today as it was yesterday: Steven Spielberg’s Lincoln is the Best Picture front-runner. Yes, there’s been a lot of talk this year about how there isn’t a single front-runner — and I remember some unwise pundits crowing after Lincoln’s New York Film Festival debut that the movie wasn’t grand enough to even warrant a nomination, let alone a Best Picture win — but the simple truth is that Lincoln always had the makings of an Oscar favorite, and after leading the field today with twelve nominations, that Best Picture laurel seems all but assured. Still, is there anything that could slow its buggy ride to victory? Here are five Oscar imbroglios for Lincoln that could potentially come to pass (we’re leaving out the possibility of Daniel Day-Lewis losing Best Actor, because we’re not idiots). Steven Spielberg could lose Best Director. Though I think Spielberg’s got to be considered the front-runner in this category if Lincoln is the Best Picture favorite, Director/Picture splits are becoming more common. The question is, who would take the trophy if not Spielberg? Life of Pi director Ang Lee is no stranger to a split, as he won Best Director for Brokeback Mountain even as the film lost Best Picture to Crash; meanwhile, David O. Russell scored in every major category for Silver Linings Playbook, indicating a strong hand to play. But we’re sensing a potential surge for Amour director Michael Haneke. The 70-year-old helmer is regarded as a modern master, and this may be the Academy’s best and only chance to reward him for it, since he’s made a powerful film (nominated for Best Picture) about love and aging that hits voters close to home. Russell and Lee will surely be back in this category in the years to come, but will Haneke have the opportunity? Tommy Lee Jones could lose Best Supporting Actor. I don’t think there is a front-runner in this category, even though most of the nominees have been pretty much locked down for months. All five of the men nominated here have won before, so it’s something of an even playing field, and Jones has a super-tasty Lincoln performance full of Big Scenes, which could give him an advantage. But Robert De Niro and Philip Seymour Hoffman are no slouches, either. The former has dropped not-so-subtle hints about how much he’d like a trophy, while the latter, in particular, could win for what’s basically a co-lead performance. Sally Field will lose Best Supporting Actress. Well, duh. She’s up against Anne Hathaway. Lincoln could lose Best Editing. The Best Editing laurel is usually considered a bellwether for Best Picture: A film can rarely win Picture if it isn’t at least nominated for Editing, while the film that does win Editing often goes on to win Best Picture. That said, Lincoln has some pretty tough competition in this category, squaring off against four other Best Picture nominees, including two — Argo and Zero Dark Thirty — who didn’t manage Best Director nods but have the kind of tricky intercutting that voters typically go for. Can the comparatively languorous Lincoln really pull out a victory here? Lincoln could lose Best Picture. But to whom? Only Best Picture nominees Life of Pi and Silver Linings Playbook scored corresponding Best Director and Best Editing nods, indicating that they are Lincoln’s strongest competition. Life of Pi is pretty Spielbergian on its own, what with all those beatific faces and visual money shots, so I don’t see it as the Lincoln alternative. Instead, that slot would go to Silver Linings Playbook. Too bad Silver Linings producer Harvey Weinstein has no experience going up against a war-era Steven Spielberg film and snatching away its Best Picture win with a smaller-but-beloved dramedy that features a star-coronating Best Actress performance. Oh, wait.